There are always new projects in the works for us! Here are a few of our current projects. Spanish Translation of the Confident Kids Curriculum. Over the years, we have had multiple requests for a Spanish edition of CK for use here in the US and in other Spanish speaking countries. Now, with the help of several key people, we are finally realizing our dream of having the Confident Kids Units translated into Spanish! With a total of 996 pages to be translated, this is no small task! But the project is well under way, with the Feelings Unit as our first volume. 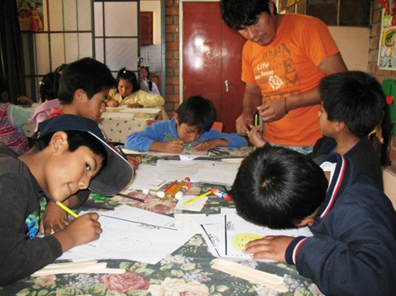 This picture is of a CK group in Peru. To test out the curriculum, we are lining up pilot groups right now. If you have a site that may be interested in being one of our pilot sites, please send us an inquiry by email. Kids Like Me! Family Edition. This project will expand the current Kids Like Me! curriculum into a family program by adding lesson plans for teens and parents/caregivers to the curriculum. With the addition of this Family Edition, we will complete our program for children and families affected by drug and alcohol addiction, and other related issues. We are excited about this expansion, as it will dramatically increase the effectiveness of the KLM curriculum. CK Area Representatives. It has been said that Confident Kids is the best kept secret around, and we agree! Therefore, we are seeking to train interested individuals to join in this ministry by starting a CK ministry in their own areas. What does that mean, exactly? Click here for more information! Kids Caught in the Crossfire. “Kids Caught in the Crossfire” refers to the children who are the innocent victims in families where a parent or other family member is addicted to alcohol or other drugs. Here in Santa Maria, we are working to create a city-wide network of support groups to minister to these children and, when possible, to their parents, too. Our goal is to bring together both Christian and community agencies to use our CK and KLM materials to minister to these kids and families. The end result we are seeking is to develop a model for establishing such city wide networks that we can share with other communities.